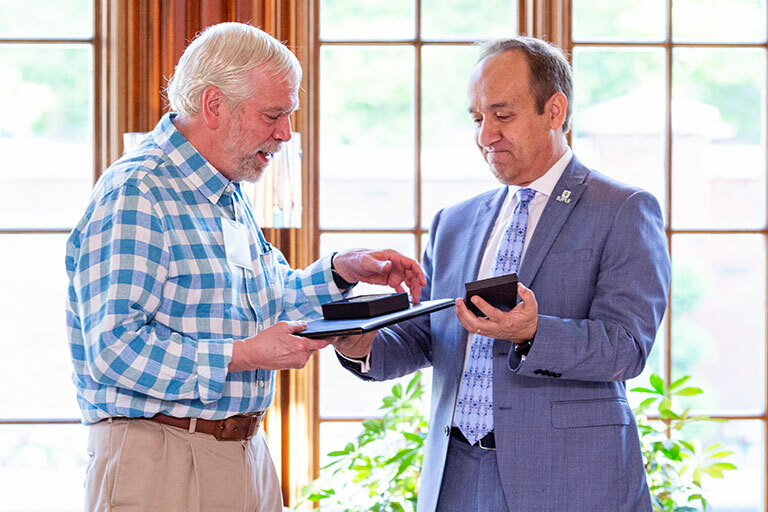 Chancellor Nasser H. Paydar honored David Lewis, retiring Dean of IUPUI's University Library, with the IUPUI Chancellor’s Medallion during the Dean’s Recognition Reception on May 14, 2018. Dr. Lewis began his tenure at University Library in 1993 and was appointed dean in 2000. His distinguished career is characterized by significant accomplishments in academic technologies, access to educational resources, and library integration into campus and community life. This work culminated with the publication of his acclaimed book Reimagining the Academic Library in 2016. Dr. Lewis helped create the Marion County Internet Library, a collection of research databases that can be accessed from within any public, school, or university library in Marion County. He served on the Indiana State Library Advisory Council, leading the group from 2008 to 2012. He also contributed to the early planning and growth of INSPIRE, Indiana’s virtual online library. As part of his work with Academic Libraries of Indiana, Dr. Lewis oversaw the Indiana Shared Print Project, a 36-library collaborative collection. In recognition of his leadership, Dr. Lewis was named the 2018 Association of College and Research Libraries’ Academic/Research Librarian of the Year, showcasing his accomplished career and recognizing his influential research and scholarly writing. In April 2018, Dr. Lewis was also honored by Indiana Governor Eric Holcomb with a Sagamore of the Wabash, the highest honor bestowed by the governor of Indiana and a personal tribute to those who have rendered distinguished service to the state.